Celebrate National Tequila Day: July 24th! Reserva de la Familia is an award-winning Extra Añejo (aged) Tequila made from hand-selected, 100% pure blue agave grown in the Cuervo estate’s richest volcanic soils, just outside the town of Tequila. 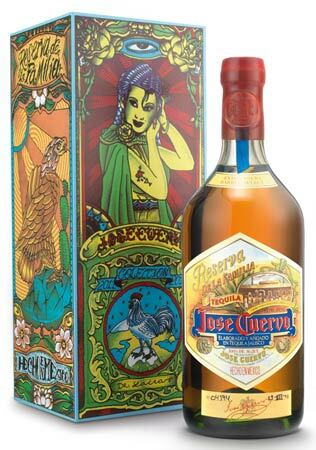 Reserva de la Familia, a crown jewel of the Cuervo portfolio, is considered to be a collectable masterpiece by spirit connoisseurs around the world for both its superior taste and uniquely designed packaging. Each year since 1995, the Cuervo family has selected a renowned Mexican artist to paint the new handcrafted wooden box for its ultra-premium vintage Tequila – part of its continuing support for promising Mexican artists and local culture. This year’s edition features the artistry of Dr. Lakra, who is the first artist that transcends the subculture of the tattoo art. Dr. Lakra started creating tattoo illustrations in 1990 when he discovered that tattooing was a form of art that could be transferred from the skin to a variety of inanimate surfaces. By mixing traditional tattoo art and Mexican graphic art, Dr. Lakra transforms objects such as vintage posters, Japanese print art, paper glasses and plastic dolls in drawings. Lakra’s work has been shown in individual exhibitions in galleries around the world including London, Berlin, Tokyo, and of course Mexico. This exclusive Tequila is part of a private family tradition dating back to 1795, when the Cuervo family would descend into their private cellar to share the finest Tequila reserves with a select group of family and friends. In 1995, to celebrate the 200-year anniversary of the Cuervo brand, the family decided to share Reserva de la Familia with the rest of the world, and began issuing limited-edition bottles. Aged in new French and American charred oak barrels, Reserva de la Familia has a full, mellow taste that combines floral, agave, vanilla, nut and Cognac-like flavors. It is typically sipped just like a cognac ideally in a Tequila tasting glass or a snifter. Each bottle is carefully assembled by hand, numbered and dated, hand-dipped in wax and then placed in the handcrafted wooden box. The 2011 Reserva de la Familia is expected to be available in December 2011 for approximately $125 USD per 700ml bottle. Jose Cuervo is the largest producer of tequila throughout Mexico and around the world. The Jose Cuervo portfolio of tequilas includes Jose Cuervo Especial Gold, the number one tequila worldwide, Jose Cuervo Especial Silver, Jose Cuervo Black Medallion, Jose Cuervo Tradicional 100% Agave Reposado, Jose Cuervo Platino, Jose Cuervo Reserva de la Familia, Authentic Jose Cuervo Margaritas and Jose Cuervo Margarita Mix.